I picked up a copy of Bearly Awake , by D. R. Perry, from Amazon. It was free at the time. Bobby Tremain’s life used to seem charmed, but since his dad’s crippling accident, he has an avalanche of problems. He’s the first in his family to have a shot at college, also the first to head north of Louisiana. 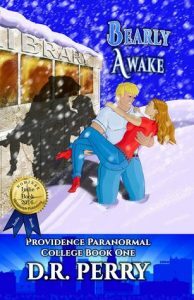 An early snow calls his Bear to hibernate a week before finals, but he needs to pass or he flunks out of Providence Paranormal College. Lynn Frampton’s loneliness is almost more than she can take. She went to college on the other side of the country to get away from the persistent curse of unpopularity in a small town. Once at college, Lynn’s prickly personality has pushed everyone away yet again. At least, she’s at the top of her class. Bobby needs Lynn’s help to stay awake and pass his exam, and she discovers she needs companionship more than she’d ever imagined. Lynn’s all set to transfer to a school back home, but Bobby thinks she’s his mate. Can he keep awake long enough to pass, and more importantly, convince his love to stay? So, this wasn’t necessarily bad. It fit the bill of being fluffy and non-taxing, which is what I wanted when I picked it up. But I didn’t feel like it held together very well. The plot jumps around and a fairly large mystery isn’t solved. Worse though, was the main character, Lynn. She’s supposed to be smart and sassy and snarky and sarcastic. I know this because her internal monologue tells me, the reader, about it a dozen times. But I just found her unpleasant. Sure, there’s some fun nerdiness, that I and a large portion of the female populace recognize and appreciate. But it’s treated like she’s something special for it. And her constant, “I’m not like other girls because I’m smart,” is a blatant insult. It infers that other women aren’t smart. Duh. Basically, it felt like the author was trying way too hard to be funny and it just fell flat on its face. This entry was posted in books/book review and tagged book review, fantasy, romance, shifters on February 19, 2018 by Sadie.